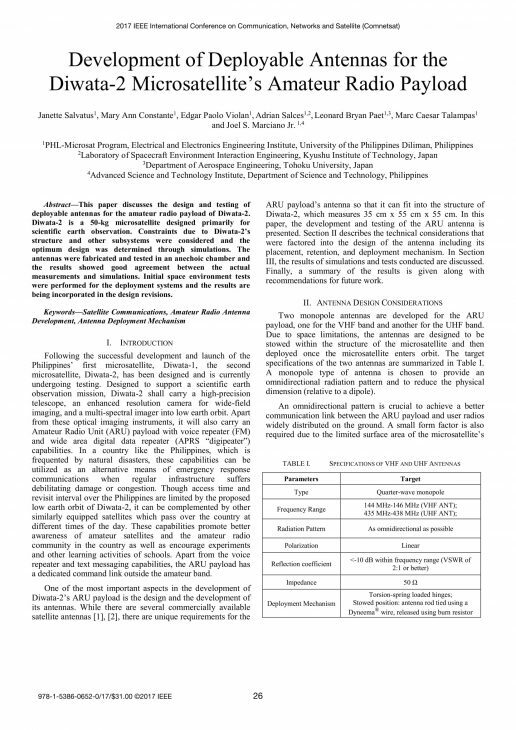 This paper discusses the design and testing of deployable antennas for the amateur radio payload of Diwata-2. Diwata-2 is a 50-kg microsatellite designed primarily for scientific earth observation. Constraints due to Diwata-2’s structure and other subsystems were considered and the optimum design was determined through simulations. The antennas were fabricated and tested in an anechoic chamber and the results showed good agreement between the actual measurements and simulations. Initial space environment tests were performed for the deployment systems and the results are being incorporated in the design revisions. Dr. Marciano, Jr. Joined the DOST-ASTI in March 2016 as its Acting Director. He is a licensed Electronics Engineer who graduated with a degree in Bachelor of Science in Electrical Engineering from the University of the Philippines, Diliman and was conferred with Doctorate Degree in Electrical Engineering from the University of New South Wales. Under his leadership, the DOST-ASTI is reviving and ramping up its research on radio frequency (RF) electronics. This is done through various research projects, some of which are in collaboration with the UP-EEEI. Aside from form overseeing the operations of the DOST-ASTI, Dir. Marciano Jr. is currently engaged in several projects such as Communications Relay Buoys for the Communications Relay for CoCoMoNets, Development and Deployment of Advanced Spectrum Platform Network, Development of Software Defined Radio (SDR) based Satellite Telemetry and Telecommand System Simulator Projects, and Development of Extreme Weather Monitoring and Information Sharing System in the Philippines as Project Adviser, as well as the Project Leader of EPDC as Platform for Inclusive Innovation Program (EPIIC) and Synthetic Aperture Radar (SAR) and Automatic Identification System (AIS) for Innovative Terrestrial Monitoring and Maritime Surveillance.